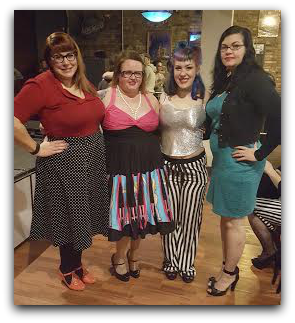 James and I decided to beat the winter doldrums this past weekend by attending a burlesque show by The disDress Dolls in South Bend, Indiana. We were supposed to meet up with some of my online friends (the lovely Kitty Cabriolet and Miss Vera Fine) as well as Miss Ally Boobior and Dr. Penrose - two of the performers as well as our friends. Unfortunately, I really enjoy sleep and even though my alarm went off I moved it another hour thinking I would have enough time. Est and Cst were working against me - South Bend is on Est! I was mortified and upset when I realized my mistake. We missed dinner which was a bummer (plus we were hungry to boot) but made it to the show venue in plenty of time. In fact, we were early! Ha ha. 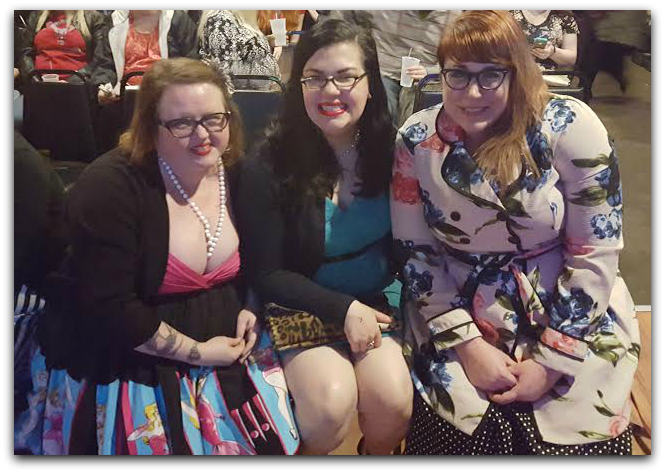 Vera, Me, and Kitty before the show started! I wasn't surprised that the seats for the show filled quickly, with many people saving seats for others, but still the seating was limited. James and I nabbed two front seats and I was able to save an extra for Vera. Kitty found an extra bar stool and sat two rows back. Tip: if you attend one of the shows get a seat as soon as possible! Kitty, Vera, Ally, and me after the show! The emcee of the troupe hilariously introduced each act whether it be a burlesque performer or a comedian. I remember I laughed so hard and my eye watered and then wouldn't stop watering until intermission. Each performer/member did a solo routine often with a pleasing 20's cabaret style. Elctro-swing music is one of my favorites especially when perfectly paired with a burlesque routine. It's very fitting and perfect. There was a fair mix of modern themes as well! Ally Boobior and Dr. Penrose teamed up for a couples dance act. At the end of that performance Dr. Penrose flawlessly exited the stage for the Ally to continue the story with her solo number. There were so many awesome acts and dances I can't write them all down but the final number was the troupe leader, Miss Veda deVille, doing a fan dance! I love fan dances - and she used three different sizes of fans! It was the perfect ending to the show, but I didn't want it to end! Me with Veda deVille after the show! It was nice to get out of the house on the weekend and meet everyone! I don't know when the next performance is - ha ha, they just finished a show and I'm ready for the next one - though I'll include it on my new (coming soon) events page. You'll be sure to see me there! If you get a chance check out the disDress dolls Facebook page or watch some of Veda deVille's solo performances on YouTube as well as the website! 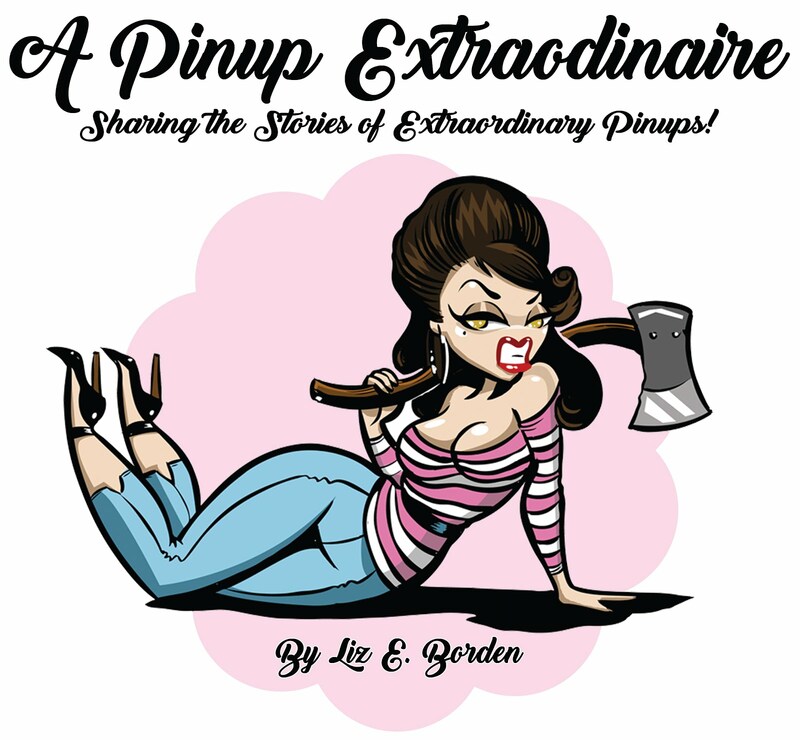 Ever been to a burlesque show? What was your favorite part? Let me know in the comments!